We have been coming to this part of the world all our adult lives. 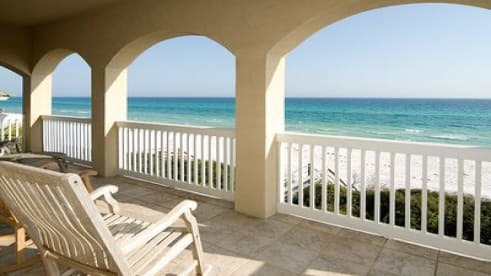 Richard grew up in Jacksonville Florida and thought THAT beach was perfect - until he saw the white, white sand and beautiful blue/green water here on the emerald coast- and we also have waves! We bought property years ago and then sold it and then bought others. We bought our lot sight unseen as nothing was around, and then it took years for the architect to plan, and then the state planning/zoning commission to give us the go ahead to build. Then several more years to build our plans into reality. It's tough building right on the GULF! This has been a labor of love, and we think you will see this in our home. We love our home, this magical place and the beauty all around us. We have wonderful family and friends' memories here. We know you will as well!